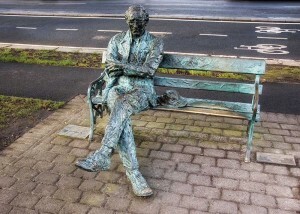 The adjacent poem by Patrick Kavanagh, who enjoyed an umbilical-like relationship with this old house during the 1940s and 50s, represents in many respects the cultural iconic image that Searson’s pub had attained in decades past. But while the patronage of Ireland’s most famous rural poet might seem romantic if seen through the contemporary eye, it was in real terms totally different when seen through the eyes of proprietor, William Searson. In those days Kavanagh had not yet attained national fame and a life dedicated to composing poetry as opposed to regular and reliable employment was seen in the austere post-war years as non-conformist, bohemian and uncertain, if not downright irresponsible. Besides the lot of the committed poet was riddled with financial insecurity, and indiscretions of a pecuniary nature were most undesirable in the conservative bastions of the Dublin licensed trade. That is not to say however, that the rural poet was unwelcome in Searson’s; on the contrary, Kavanagh had a great affinity with the premises when he lived close by on 62 Pembroke Rd. Each day he passed the pub with gusto en route to city centre where he sought an audience with R.M. (Bertie) Smyllie, then editor of The Irish Times and renowned patron of the arts. Smyllie paid £1 for each poem published and Kavanagh danced with delight all the way back to Baggot St. when successful, where he gleefully drank half his earnings in Searson’s. When he lived on Pembroke Rd. Kavanagh fell madly in love with Hilda Moriarty, who later married politician and Government Minister, Donagh O’Malley. During the early 40s he wrote prolific love poetry to woe the beautiful Hilda, and on occasions invited her into Searson’s. When he later heard of her intended engagement to the dashing Limerick architect, he penned the immortal poem Raglan Road, initially called ‘ Dark Haired Miriam Ran Away’. In later years Kavanagh fell out of favour with Searson’s pub primarily because of his association with fellow writer Brendan Behan. Their relationship was always tempestuous and volatile and on many occasions boiled over at the counter. When William Searson’s reprimand of “conduct yourselves, Gentlemen,” was ignored on one occasion too many, they were both shown the red card. On his good days Behan was a masterful showman: witty, humorous and engaging but on his worst days he was rude, irreverent and uncontrollably vulgar. On one occasion he chided Kavanagh: “You’re only a f***ing minor poet anyway”, to which Kavanagh replied, “since Homer we all are”. On Behan’s passing Brian O’Nolan aka Flann O’Brien said in tribute “that Behan excelled in language and was a total master of bad language”. It would, however, be unfair to lay all the blame at Behan’s door for the fallout because Kavanagh too was not deficient in rude, abrasive, and vulgar behaviour. While the literary connection affirms Searson’s cultural heritage, this old watering hole has a very distinguished licensing history dating back to October 1845 when the name Henry Tobin, Grocer, Wine & Spirit Merchant, appeared above the door of what was then nos. 21-22 Upr. Baggot St. This was both an important and prosperous thoroughfare in Dublin’s narrative as Baggot St. Surgical Hospital was located at no. 9 on a street heavily populated by surgeons, solicitors and merchants. The affluence of surrounding Victorian Dublin brought a steady steam of business to Henry Tobin’s busy pub and grocery. The Victorians had a particular affinity with tea, which was then both an expensive and extravagant item. In that era when Dublin prospered as the second city of the British Empire the supply of tea was largely controlled by the East India Company who annually shipped the freshly harvested tea crop from India, China and Ceylon. While the voyage to and from the Far East had previously taken almost a year all was changed with the arrival of he Tea Clippers, which were sleek, easily manoeuvrable and the fastest sail vessels on the ocean. The new American clippers could complete the voyage in 97 days, some three times faster than the ships of the East India Company. Each year in Baggot St. there was uncontained excitement amongst the Victorian ladies as the new crop of China tea arrived. This was good news for Henry Tobin as tea was a very important and very profitable sales item. And of course the great bonus to Henry was that the ultra respectable Victorian ladies who purchased tea invariably consumed a few gins while they waited. Of course this was the ultimate hypocrisy of the prudish and seemingly austere Victorians who abhorred drunkenness and refused to drink in public places but secretly consumed large quantities of alcohol in their homes and in the confined spaces of Dublin’s snugs. The snug, which was always located in the grocery area at the front of the shop, had its origin in this period specifically to accommodate the straitlaced Victorians. Henry Tobin remained at the helm here until 1884 when he was succeeded by one of Ireland’s most distinguished and successful licensed trade operators in William Davy, Grocer, Wine & Spirit Merchant. William was the youngest of the three Davy brothers and his two older brothers already traded on Baggot Street at nos. 2 and 8. Additionally they traded at 33 South Richmond St. (The Portobello) and 11 Upr. Leeson St. In this era the Davy’s were Dublin’s most respected Victorian grocers, wine merchants and publicans who later attained literary immortality through James Joyce in Ulysses. Thomas Davy was appointed a Justice of the Peace and was highly regarded by the administrators of British Rule in Ireland. In 1890 William Davy completed a lavish Victorian renovation on this old house that was to remain in situ for almost 100 years. He was rewarded for his endeavours some two years later when the Earl of Pembroke, George Robert Charles granted him a new 150 lease for an annual rent of £29 – 12s – 6d which was reduced to £28 per annum in consideration of how well he had enhanced the premises. William Davy saw out 1916 and the War of Independence from this thriving pub until he passed away on March 4th 1920. Most of Baggot St. was closed down as on Easter Week 1916 as the heaviest engagements of the Rising took place along nearby Northumberland Road, Mount St. Bridge and Boland’s Mills, all of which were under the command of Eamon De Valera. Following his demise his executors ran this old pub until September 28th 1923 when his widow Mary Josephine sold out the leasehold interest to brothers William and Michael Searson. By this time family history was repeating itself here as Searson’s older brother Charles was already trading from no. 2 Upr. Baggot St., which he had acquired from J & T Davy, brothers of William. Next door to Searson’s and previously Davy’s stood the celebrated Bergin’s Drapery Store at no. 40, which had attained recognition across Dublin’s Victorian suburbs for their made to measure suits. For some three years this pub was known as Searson Brothers until April 9th 1926 when Michael Searson assigned his interest in the premises solely to his brother William. Over the next 40 years Searson’s established an unrivalled reputation as a well run establishment that attracted strong local patronage and a strong connection with the sport of rugby because of its proximity to Lansdowne Road. It also became a very popular oasis of liquid comfort to those who worked in the Fourth Estate, especially sports journalists. The pub experienced a literary connection through its association with Kavanagh, Behan and for a time with Flann O’Brien aka Myles na gCopaleen, who lived on Avoca Road, Blackrock and through the patronage of many writers and journalists. William Searson passed away on August 20th 1959 and the pub was sold to the Hardy family at public auction for £30,000 on May 26th 1961. Thanks to Mr. Eamonn Casey for this fine account of the literary, commercial & cultural life that Searsons of Baggot Street is fortunate to have been part of since October 1845, long may it continue.